Congratulations to the Ayi International School for scoring the highest in their region on their standardized tests! Today was the day of the esteemed and much awaited day of Kindergarten graduation. For some reason, it is a very big deal in Ghana. An elegant set up was created for the event complete with large speakers, chairs and tables. The event was supposed to start at 10 am, but like always it did not begin until noon. The entire lower school was in attendance as well as all the teachers. Many members from the Parent Teachers Association as well as the Ghana Board of Education were present for the ceremony. To our surprise, nearly every parent of the children was sure to make an appearance. The music, as always, was being played at a ridiculously high volume, and it was the same songs over and over again. The ceremony began with a prayer and then introductions. The event was run by the master of ceremonies and one of the school’s teachers, Somaila. He does a great job controlling the order of the program and interacting with the audience. The ceremony contained many traditions, the first of which involved the kindergarten class standing coming on stage and performing a song for the audience. The students then proceeded to change into athletic clothes to play games. Everyone transitioned over to the fields to watch the children compete in tug of war, sack races, and spoon balancing races. It was adorable to watch and the parents enjoyed the fun competition. After the field games had finished, the students changed into their cultural uniforms. They performed a play and then a cultural dance they had been working hard on all semester. Still in their same uniforms, each child stepped up to the podium and recited a poem of their choice. This took some time as you can imagine, but it was a pleasure to hear the students that were strong public speakers. For students that performed particularly well, parents and others from the audience would throw money at them to donate towards the school. One boy cried every time he had to speak publicly, this brought much laughter from the student body and I felt so bad for him. 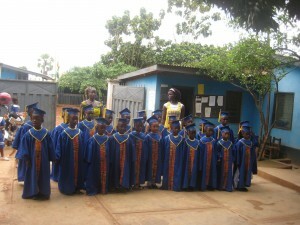 The class then went into the library to change into their blue graduating gowns complete with caps and kente cloth lining. During this time, the lower school held a dance competition to pass the time. Finally the kindergarten class returned in their robes and strolled two by two onto the center stage to receive their official diplomas. After each student received his/her certificate their picture was taken with their respective parents who were in attendance, which was mostly mothers. Every mother in the audience seemed to be carrying a baby which I also found interesting. 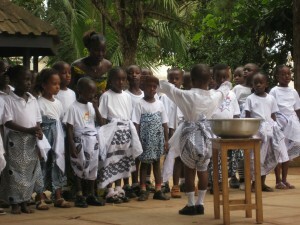 The ceremony crawled on in typical Ghanaian fashion with more announcements and presentations. I was amazed at the patience exercised by the rest of the lower class school-mates that continued watching attentively. Many pictures were taken throughout the ceremony by a hired photographer and I was flabbergast to see some parents in the audience already holding printed pictures of their child! I discovered later that the dj’s had brought a printer on site which the man was using to print pictures straight from his digital camera. It was actually a great idea and the man was surely turning a nice profit. After many grueling hours the ceremony finally came to a close. Mmaa and Bill both looked very pleased with the way things went and it was great to witness such a meaningful milestone event in the children’s lives. It was especially nice to see Mohammed, one of the children from the house, graduate with his classmates. The following is a description by one of our volunteers of one of the students living at the school and being taken care of by your donations. Parents: Naha’s father, Awudu, is one of Mmaa’s brothers. Naha’s mother is one of three wives. Background: Naha comes from a poor family that never invested any money in its females. Naha’s father is a farmer with three wives and eighteen children. The father believed that only his sons should go to school, therefore none of his daughters ever received the opportunity to be educated. When the father was young, he thought he could take care of all the children, but he soon became overwhelmed. He became sick with older age and was unable to work and provide for his family. He could no longer pay the school fees for any of his children, let alone clothes to dress them. Mmaa remembers that Naha’s father came to her one day when his wife was pregnant with another child. He told Mmaa that if the child was a girl it would be hers and if it was a boy he would keep it. Mmaa was not sure how to respond to the situation, but out of guilt she agreed to purchase the pregnant mother a cloth to wrap the baby in when it was born. After some time Mmaa had completely forgotten about the situation. Then one day, the mother showed up at Mmaa’s door holding baby Naha in her arms. She told Mmaa that her father ordered her to give the baby up and thus Mmaa had no choice but to accept her. Mmaa allowed little Naha to eat and sleep at her house and agreed to send her to school to give her an opportunity she herself never had. Bill explained that Naha was a consequence of poverty in Ghana. When she arrived at the house she was emaciated, poorly clothed, never spoke and avoided most interactions with others. Mmaa first placed Naha into kindergarten at a government school, but it did not work well for her. Mmaa then decided to move Naha to a different local private school called Animantu, but again Naha was not performing well and was years behind in both reading and writing. Bill described Naha as being verbally inarticulate and difficult to motivate. Mmaa finally brought Naha to the Ayi Owen School and placed her in first grade. Although she was old for the grade, she began to perform well and has been doing so ever since. Bill fondly recalls that when Naha was still in preschool, maybe three or four years of age, she would sneak off with Bill to play basketball after finishing her homework. After some time, Bill would leave the ball out for her to use when he was not around. Bill observed how Naha would throw the basketball underhand towards the rim over and over again. Bill noted that Naha was determined to make a basket, and from that he knew she had a special drive in her. It became clear to the Owens that Naha expressed herself more through sports than words. Mmaa explained that Naha’s mother and father have each come only once to visit Naha at the house. When the father asked “Do you know who I am?” to Naha, she responded that she knew who he was, but refused to refer to him as her father. Some of Naha’s brothers and sisters have stopped by to visit, but Naha does not care for them as they were not there for her when she needed support. Mmaa continues to be the sole supporter and provider of Naha because her parents are incapable and imprudent. Naha’s real name is Alimatu, after Mmaa’s mother. But to avoid confusion she has always been referred to as Naha, which actually means ‘grandmother’. Naha has a tribal marking on her face that she received when she was an infant. The horizontal scar is a symbol of the Bole tribe. When the cut is first made, it is filled with medicine in order to act as protection from diseases throughout the individual’s life. It is also a sign that Naha will always be part of the Bole tribe and to remind her of her roots. 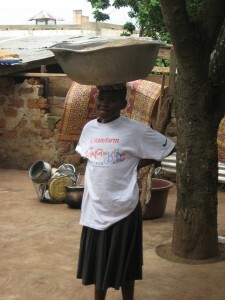 Naha has progressed tremendously under the care of Bill and Ayisatu. She has doubled in size since she first came to them more than eight years ago. She now excels in school by being in the top quarter of her class and gets along well with the other children at the house. Naha helps out around the house by cooking, cleaning, washing clothes and performing any minor duty that needs to be done. In her free time she loves to jump rope, dance, draw, and play games. Naha always has a smile on her face and is very fun-loving and approachable. With the continued support of the Owen family and her peers at the school, there is no doubt that she will continue to thrive in such a nurturing environment. 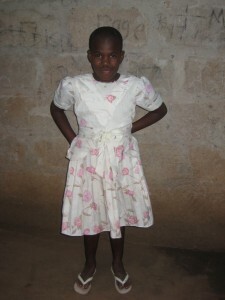 If you would like to help Naha and other children living at the school, please donate. Contact us if you would like to sponsor her or other students living at the school. Please find below the most recent “Wish List” of items for the Ayi Owen School. We have a short deadline for these items to be collected. 1. Max to pick up at Janie Owens: Tennis balls. 12. Pens with different color inks… different color exterior. 14. Blue T-shirts for all 27 teachers. A FEW MEDIUM BUT MOST XL. Beauty and the Beast, Pinocchio, Sleeping Beauty, Lion King, Charlotte’s Web, Ali Baba and the forty Thieves, Some Pig, Titanic, Aladdin, Julius Caesar, Hamlet. We also seek films about animals and wild life, nature and travel. 11. Pens with different color inks… different color exterior. 13. Blue T-shirts for all 27 teachers. A FEW MEDIUM BUT MOST XL. 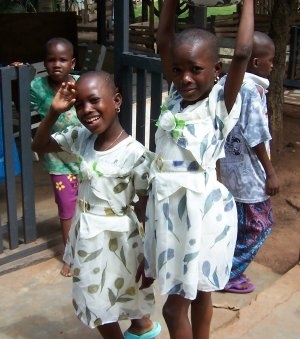 Fuseina and Asana Issaka are two of several “School Orphans” who’s parents dropped them off and never picked them up again. 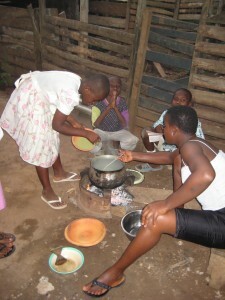 The school orphans live in the same housing as the volunteer quarters adjacent to the original school site (currently both the original school site and the new schools site are being used to conduct class sessions). If you volunteer at the school you will meet Fuseina, Asana Issaka and others like them helping out at the school and spending time with the volunteers. 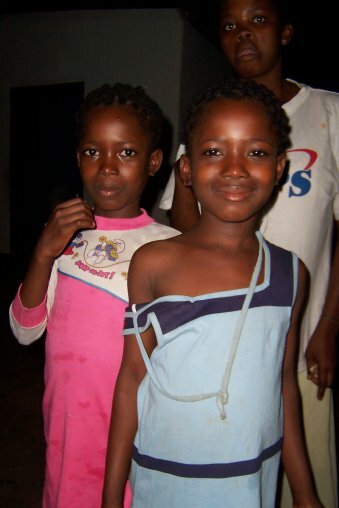 Fuseina and Asana Issaka are among those who’s school fees are paid for by donations from For One World via our scholarship program at Ayi International School. 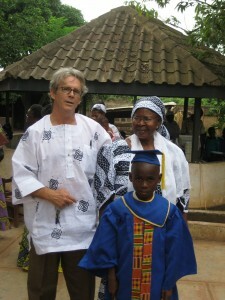 Below is an interview with Ayi Owen co founder of Ayi International School. Father is makes charcoal and farms in a remote village near Wenchi on the road to Ivory Coast. At times he has given money for the upkeep of his twins. He is close to the twins, while the mother is never seen. The mother came to the house once to take the children away. I sent her away. The mother has no money or education and therefore cannot care for the children. Her profession now is chasing men. One day I was here and the father showed up with two children. There were really small, about two years old. The father came over to greet me. I asked him about why he is traveling today with his children. He said that the mother threw the children on him and ran away. Too bad I replied. Yes, and I am bringing the children to you. He said he could not care for the twins. He said he was too old. I am a man and I cannot take care of children. After what seems to have been a long time, Ayisatu got up to go inside. When she came back, the father was gone. But the children were there with their black polyethene bags (no suitcases). The father had told the twins that he was going out and he would be back soon. “Grandmother” will be out shortly. Ayisatu asked, where is your Dad? The twins and Ayi waited and waited. But the father never came back. He was gone. After 3 months the father showed up at the house. I asked why did he do that to me. What can I do, he said? When the children came to me here in the homestead, I put them in the school. They did not like to go to the day nursery. They could not do their ABC’s correctly. Everyone laughed at them. Rather they said O B C. Mansuru to this day laughs at them. Before the father had showed up again, I had already put them in school. 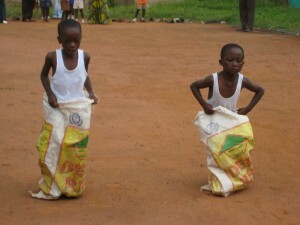 In the polyethelene bags the twins had dirty and torn clothes. I had to throw them away. I went to the market and got new clothes. That is all I know. So now the twins are here. The twins would go and hide in the metal container behind Fred’s house because they did not want to go to day nursery. 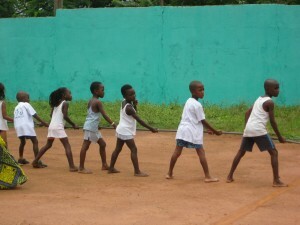 They ran away whenever Ayisatu saw them. So Ayi explained that there was a big, big snake in the container and they should stay out. They no longer had a hiding place so we got them to like school. The twins would sleep in my same bed and would put their feet on me (Ayisatu) all the time. I would threaten them and put them on the floor to sleep on a mat. When I would fall asleep, they would get up and enter the bed again. Then the small feet would be pushing on me and I would know that they had come up from the floor. When Mr. Owen returned from the US, the twins were afraid. They slept with Salah down in the hollow. Later they all slept on mats in Miriam’s room. I told them that if they came over to our room, then that white man would beat them. At that time they were not yet potty-trained. In fact, they would urinate on the floor, not even in their chamber pot! They could be a bother. The father is broke now. The police have stopped the production of charcoal. So there is no work for the father. Recently he promised that he would bring money for a pair of shoes for each of the twins. Later he came by to say that he could not help these days because he has no work. The twins are in 3rd grade now and they help me sell things in the store. These twins take care of me. They know the store items better than me. Then at night under the security lights, they run their own make-believe school. They take turns being the teacher. You are currently browsing the archives for the About the Students category.